The leader of Iraq's Kurds said his people will one day be independent, but it will be achieved only through peace and after the fight with Islamic State is concluded. Kurdistan President Masoud Barzani was speaking in Washington after talks with US President Barack Obama and Vice President Joe Biden. The fight against Islamic State [IS, formerly ISIS/ISIL] terrorists in Iraq was among matters discussed. "Certainly the independent Kurdistan is coming," Barzani said through a translator, adding that any referendum on independence will be held only after the war against Islamic State extremists is resolved. “We want it to be not through violence, not through killing. 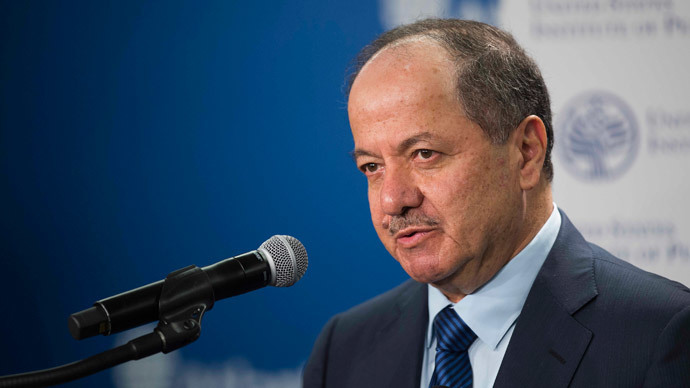 We want it to be through peace and dialogue,” Barzani said, as cited by Reuters. The rapid advance of the Islamic State has prompted the Kurds to boost the strength of their Peshmerga militia and take the frontline in the fight against the extremists. This in turn has triggered concerns of possible ethnic and religious splits in Iraq. Talking to Barzani, the US President and VP insisted "a united, federal and democratic Iraq" is necessary to fight the Islamic State, and that is the kind of Iraq Washington supports. Barzani, in turn, said that Kurdistan's current unity with Iraq is a matter of choice: "The important thing is for attempts to be made for everyone in Iraq to have that conviction that it would be a voluntary union and not a forced union." However, he also said that Iraq owes Kurdistan, a semi-autonomous area within the country, 17 percent of the federal budget under an agreement in which the Kurds export about 550,000 barrels of oil per day, Reuters reports. Neither side has always been able to fulfil the deal in the past. Nevertheless, Barzani said the Kurds "hope that Baghdad honors that agreement." Kurds are one of the largest ethnic groups in the world lacking their own state. Kurdistan is a territory which encompasses parts of Iran, Iraq, Turkey and Syria. Of the four regions, Iraqi Kurdistan has made the most progress in defining its status politically and striving for independence.